Hundreds of Kilkenny-based nurses will picket St Luke’s General Hospital in Kilkenny today (Wednesday) as a national strike takes effect. 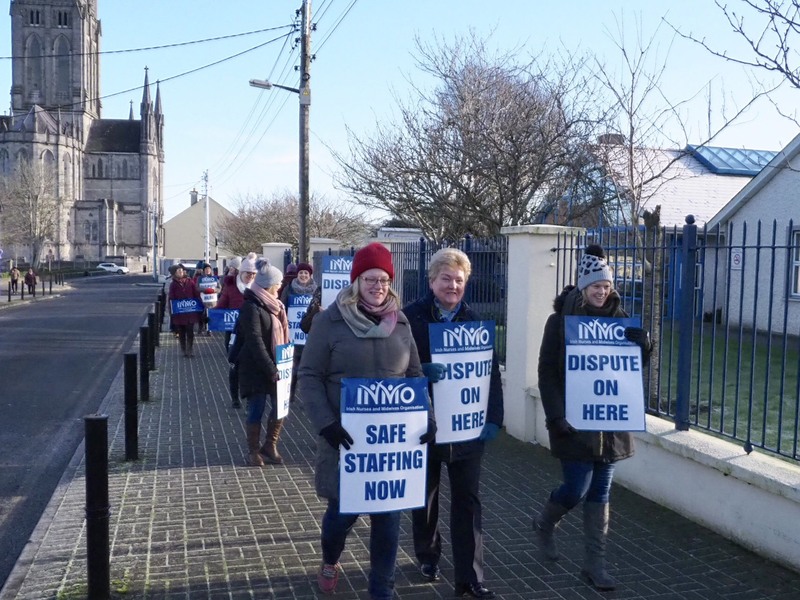 Community Care headquarters in James’ Green will also be picketed as members of the Irish Nurses and Midwives Association (INMO) take the first of six days strike action. St Luke’s General Hospital will operate on a skeleton staff who will maintain ‘life preserving’ services to patients; Kilcreene Hospital will be fully closed. Liz Curran, INMO union rep for the Kilkenny nursing staff, said that a picket will be placed on St Luke’s from 8am to 5pm on Wednesday. She said the union is expecting several hundred members to take part across the day. The union’s local strike committee worked with hospital management in advance of the strike to ensure there will be ‘life preserving’ and essential nursing cover in Kilkenny during the strike. A number of services will not be affected on this first day of the strike: residential care of older people and people with intellectual disability centres will not be involved on the first day. Other services that will remain in operation include: urgent cancer surgery, certain maternity services, colposcopy, dialysis and oncology services, palliative care and limited newborn screening. Emergency departments will remain open and people are asked to attend only if absolutely essential. Planned inpatient and day surgeries have been cancelled, all outpatient appointments are cancelled. Routine community nursing services and health centre clinics where nurses participate are cancelled. Aut Even hospital will remain open as it is a private hospital. The INMO is in dispute with the HSE over staffing and pay issues. Last minute talks at the Labour Court to resolve the dispute ended without a breakthrough, earlier this week. There will be further 24 hour strikes on February 5 and 7, and then again on February 12, 13 and 14, if the dispute is not resolved. In addition, the Psychiatric Nurses Association will commence an overtime ban on Thursday, escalating to full strike action on February 12,13. 14. The INMO argues a serious shortage of nurses across the health service is impacting on patients and and staff. The union is also calling for a 12% pay increase to bring them into line with other health professionals, to attract and retain nurses. Kilkenny's Indian nurses held a protest at St Luke's general hospital last Thursday, in support of their Irish colleagues. Kranthi, a cultural and political organisation for people in Ireland from the Kerala region, wanted to publicly express their solidarity with their Irish colleagues.